In this report from WDTV, recently the Transportation Security Administration made an announcement that they will be implementing the use of 3-D scanners in airports nationwide. Shawn Long, deputy airport director at North Central West Virginia Airport (CKB) says this security tool will make going through security quicker and easier for passengers. "3-D scanners really becomes a bigger convenience for the passengers," said Long "They won't have to take out their liquids, which will really expedite the process and cut down on wait time,"
In addition to not having to remove liquids from luggage, passengers will be able to keep their laptops in their bags and their shoes on their feet while going through security. This cut down on wait time will be especially important for local airports, like CKB, that have limited space and staff. "[At] bigger airports, like Pittsburgh, there are many lanes. Here, we do only have one lane and for a majority of passengers, they do have to take their shoes off, take their liquids and laptops out," said Long. 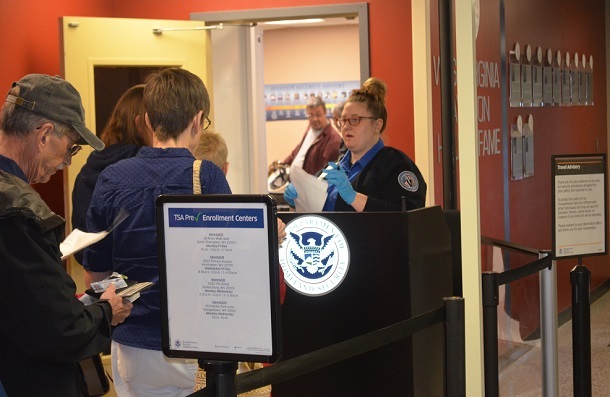 Editor's Note: Photo shows passengers going through TSA screening recently at the North Central West Virginia Airport.